The Food and Drug Administration approved the first at-home test that consumers can buy directly to check their breast cancer risk on Tuesday. The 23andMe test searches for the three DNA mutations that are found most commonly in people of Jewish descent. No doctor's prescription will be needed for the test. “These three mutations, however, are not the most common BRCA1/BRCA2 mutations in the general population,” the FDA said in a statement. The approval will likely set off a debate over whether people can handle this type of genetic information without professional help, cancer experts said. The test itself is simple enough. “The test analyzes DNA collected from a self-collected saliva sample, and the report describes if a woman is at increased risk of developing breast and ovarian cancer, and if a man is at increased risk of developing breast cancer or may be at increased risk of developing prostate cancer,” the FDA added. It doesn’t find all cancer-causing genes — not by a long shot, the FDA said. People shouldn't take the test without talking to an expert, the National Society of Genetic Counselors said. "Consumers who test positive for these mutations need to be retested in a clinical setting under the supervision of a medical professional before moving forward with any medical decisions," the group said. "Anyone who has a strong personal or family history of breast or ovarian cancer and is interested in finding out more about their individualized risk should consult with a genetic counselor to discuss their genetic testing options, or to discuss their results," the group's president, Erica Ramos, said in a statement. Dr. Len Lichtenfeld of the American Cancer Society predicts some controversy. "It is also going to add fuel to a growing fire about how we as a nation assess genetic risks for cancer, and whether society is prepared for what is inevitably going to become a genomic-influenced and informed culture of health," Lichtenfeld wrote in his blog. "Of this I have no doubt: this is the start of an early discussion on the value and role of genetic testing in the population at large. Who should be tested, what they should be tested for, what to do about those test results, and how to help people make the best decisions for their health care are all on the table." he added. Breast cancer is the second-biggest cancer killer of American women, after lung cancer. The American Cancer Society says this year, it will be diagnosed in 260,000 women and a few men, and will kill nearly 41,000. About 1 in 400 people have cancer-causing BRCA mutations. But they’re most common among people of Eastern European Jewish descent. “The three BRCA1/BRCA2 hereditary mutations detected by the test are present in about 2 percent of Ashkenazi Jewish women, according to a National Cancer Institute study, but rarely occur (0 percent to 0.1 percent) in other ethnic populations,” the FDA noted. 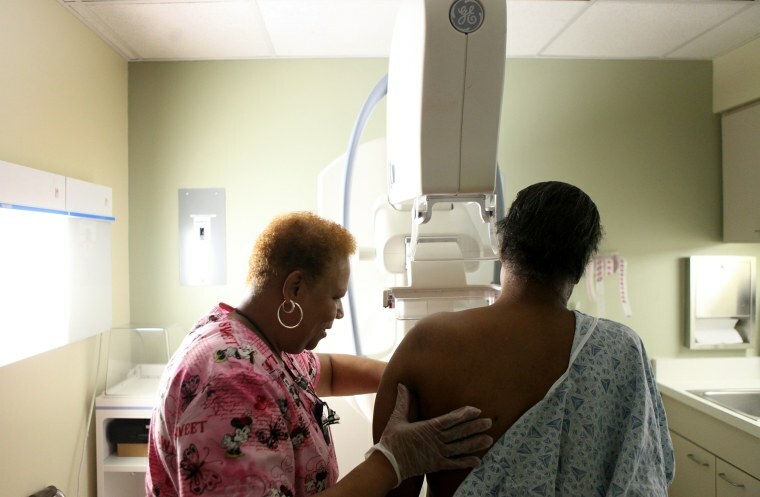 An estimated 55 to 65 percent of women with a cancer-causing BRCA1 mutation will develop breast cancer by age 70, the National Cancer Institute says. About 45 percent of women with faulty BRCA2 genes will. This compares a much lower overall population risk: about 12 percent of all women will develop breast cancer during their lives. BRCA mutations are not the only genetic mutation that raise the risk of breast or ovarian cancer. “Together, BRCA1 and BRCA2 mutations account for about 20 to 25 percent of hereditary breast cancers and about 5 to 10 percent of all breast cancers,” the National Cancer Institute says. The newly approved 23andMe test will not find all of these mutations. “While the detection of a BRCA mutation on this test does indicate an increased risk, only a small percentage of Americans carry one of these three mutations and most BRCA mutations that increase an individual’s risk are not detected by this test,” said Donald St. Pierre, who heads the FDA office that approves such tests. And the FDA said no doctor or patient should use the test as a basis for deciding treatment, “including anti-hormone therapies and prophylactic removal of the breasts or ovaries”. 23andMe battled for years with the FDA over its direct-to-consumer genetic tests, and now works with the agency to do the studies that show the tests are accurate — in return for approval to market them. Along with the approval, the FDA is setting up special controls to ensure the test’s accuracy and performance, the agency said. "These special controls, when met along with general controls, provide reasonable assurance of safety and effectiveness for this test."